Tiger Bill Reviews Classic Jazz Drummers Swing and Beyond DVD from Hudson Music. Gene Krupa with The Gene Krupa Orchestra from 1940: Featuring Gene playing drums soli along with his band members (who each had a tom-tom of their own). Sid Catlett from 1942 with Louis Armstrong and His Orchestra. Joe Harris from 1947 with Dizzy Gillespie and His Orchestra. Check out Joe's extended solo on this one. Buddy Rich from 1948 with The Buddy Rich Orchestra. Nice extended solo. Panama Francis from 1950 with Cab Calloway and His Cabaliers. Lionel Hampton on vibes from 1950 (including his tom-tom playing and trademark stick flipping) with Curley Hamner on drumset playing with The Lionel Hampton Orchestra. Gus Johnson from 1951 with the Count Basie Septet. Ray Bauduc from 1952 with the Jack Teagarden Quintet. Check out the old press roll style of playing time. Don Lamond, Lionel Hampton, and Louie Bellson from 1956 with Steve Allen's Television Orchestra. What starts as trading four's on a single floor tom escalates into a three-way drum battle as each drummer makes his way to a drum kit. Good stuff times three. "Papa" JO Jones from 1957 with the JATP All-stars JO solos using sticks, bare hands, and back to sticks again. Louis Bellson from 1957 plays an extended solo with brushes and sticks. Watch for Louie's ride cymbal that starts to slip - luckily - just at the end of his solo. Stan Levey from 1958 with Howard Rumsey's Lighthouse All-stars Stan stretches out a bit and gets to trade some fours with the band. Joe Morello from 1961 plays his "Take Five" solo using matched grip. Disappointingly, the entire solo is not included. Frankie Dunlop from 1963 with the Thelonious Monk Quartet. He stretches out a bit and then takes it home with the rest of the group. Kenny Clarke from 1964 trades 12's with the J.J Johnson All-stars Again, this clip is cut before the end. Sonny Payne from 1965 with Count Basie and His Orchestra plays an up-tempo version of "This Could Be the Start of Something Big." Kenny Clarke from 1966 with the Kenny Clarke Quintet. Harold Jones from 1968 with Count Basie and His Orchestra. Philly Joe Jones plays an extended solo from 1978. This is a very cool excerpt from the only known film of Baby Dodds. It was recorded in 1946 and shows Baby demonstrating his press roll and other drum techniques. This just might be the first drum instructional video! 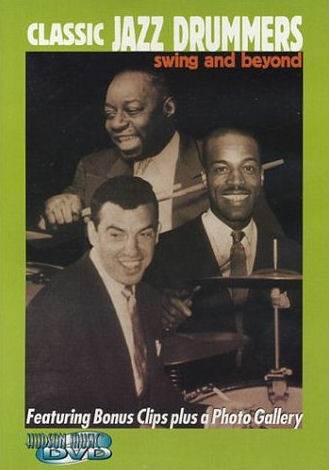 Classic Jazz Drummers: Swing and Beyond was produced by the team of Rob Wallis and Paul Siegel and CO-produced by Bruce Klauber. I recommend it. At a retail of $29.95, consider it an inexpensive lesson from some of the greatest drummers of all time.